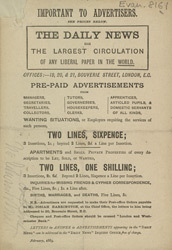 In 1834 Charles Dickens funded the production of a new newspaper. He became the editor of The Daily News, which was intended to be a radical paper to rival The Morning Chronicle. The Daily News was a great success: its liberal ideals and principles were the foundation of attempts to reform education, working conditions and equality. Evanion has written a note on this advert, but it is sadly unreadable and we do not know what it says. See if you can work it out!